A ribbon cutting ceremony was held Thursday at the new Advance Auto Parts store, located in front of WalMart in Mason. Among those pictured are Jeff Rose, store manager; Tim Larch, district leader; Dave Wheeler, loss prevention manager; Jason Price, regional vice president; D.J. Perdue, human resources representative; Mason Mayor Donna Dennis; Mason council members Ray Varian and Becky Pearson; and Bend Area C.A.R.E. members Jerry Arnold and Donnie Fowler. 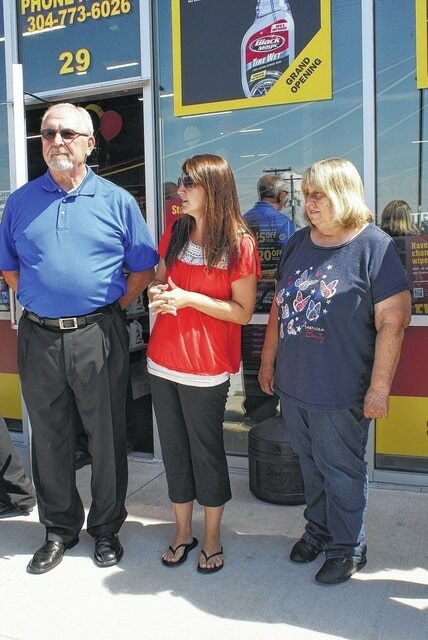 Mason Mayor Donna Dennis, center, welcomed Advance Auto Parts to town following a ribbon cutting ceremony Thursday. Town council members Ray Varian and Becky Pearson are also shown. The new store will be open seven days a week, and provided 10 new jobs. MASON — The ceremonial ribbon was cut Thursday, signifying the grand opening of Mason’s newest business. Advance Auto Parts, located at the foot of the Bridge of Honor, brings 10 new jobs to the Bend Area. Headquartered in Roanoke, Va., the company operates over 5,200 stores nationwide. Jeff Rose, manager of the new store, said the establishment will offer a wide range of auto supplies and services, including free battery testing and installation, wiper blade installation, electrical system testing, and oil and auto battery recycling. Rose comes to the Mason store after serving as manager of the Point Pleasant location for 10 years, and most recently as the Jackson, Ohio store manager for 10 years. He resides on Lieving Road in West Columbia. Tim Larch, district leader for Advance Auto, said the company is happy to open in Mason and help provide jobs and add to the tax base. “We’re here to serve the community,” he stated. Larch said the company is known for assisting with local programs and school athletics. He said the store is open for organizations wanting to do fundraisers, such as bake sales and car washes. In fact, as is customary when a new store opens, a $1,000 donation was presented Thursday to a local charity. Bend Area C.A.R.E. was the recipient of the money, and was represented by members Jerry Arnold and Donnie Fowler. Mason Mayor Donna Dennis, who assisted in cutting the ribbon, welcomed the new store. Also representing the town were council members Ray Varian and Becky Pearson. Other Advance Auto officials at the ceremony, in addition to Rose and Larch, were Dave Wheeler, loss prevention manager; Jason Price, regional vice president; and D.J. Perdue, human resources representative. Rose said grand opening specials will continue throughout the weekend. Free popcorn will be given out, and customers will have a chance to win one of two flat screen televisions. Hours for the store are 7:30 a.m. to 9 p.m., Monday through Saturday, and 9 a.m. to 8 p.m. on Sunday. In addition, customers may shop online and pick their item up in-store after 30 minutes.